If you’re a regular at Mr Green Casino, you can’t have missed the Yggdrasil Christmas promotion. This festive event began on December 1st and will be running right up until January 3rd. The promotion is broken down into 10 separate sections including tournaments, multi-game missions and mystery cash races- all of which revolve around some of Yggdrasil’s fantastic slot games. All of these prizes are paid out as real money; that means there are no wagering requirements for you to play through. Your cash will be yours to withdraw as soon as it appears in your account balance. As you already know, there are two acts to Mr Green’s murder mystery. The first £18,000 will be shared out to the players who take up the top 250 spots on a leaderboard. To earn yourself a spot on the leaderboard, all you have to do is play the Yggdrasil slot, Orient Express. Your position in the line-up will be determined by your highest single coin win when you play the game with a minimum bet size of 40p per spin. To be entered into the prize draw in the second part of the promo, you’ll need to finish up in a top 500 spot on the board. Remember you only have 24 hours to grab this chance and scoop up some of that cash prize pool. Based on the iconic Agatha Christie murder mystery, Orient Express is a stunningly designed slot which celebrates the classic genre and comes complete with heaps of killer bonus features. Read on to find out what you can expect from this recently released game. The design of Orient Express takes place on the luxurious 19th-century passenger locomotive as it cruises through some of Europe’s swankiest cities. The cartoony graphics are guaranteed to immerse you into the lavish Victorian atmosphere as symbols such as snooty travellers, shifty ticket inspectors and old-fashioned artefacts appear before an ever-changing cityscape backdrop. There are 20 pay lines to play with in Orient Express and an adjustable coin range of 1p up to £5. The bet size starts out at 20p and goes up to £100 per spin- remember you need to stake at least 40p on each spin to play your way on to Mr Green’s leaderboard. The main bonus to keep your eyes peeled for is the free spins round. This is triggered when three to fives scatter symbols show up on the reels at the once and will reward you with between seven and 30 freebies. Then there is the City Progression feature. 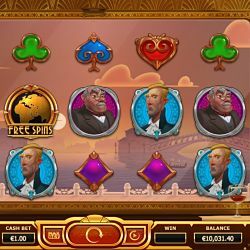 The prize you receive in this bonus increases as you travel through Paris, Venice, Belgrade and Istanbul, each city comes with its own multiplier size, free spins amount and more treats. This promotion will be active at Mr Green between midnight and 11.59pm on December 20th. All prizes in this promotion are paid out as cash and are free from any wagering requirements. The highest single coin win in Orient Express determines players’ position on the leaderboard. Players must place a bet of at least 40p on Orient Express to take part in the promotion. If two or more players achieve the same coin win, the one who completed it first will be given the higher position on the leaderboard. The leaderboard is refreshed once every 60 seconds. Only real money bets count towards this promotion,. Wagers made with free spins and bonus funds will not qualify. All players who end in the top 500 positions on the leaderboard will be automatically entered into the random prize draw. Cash prizes will be credited to winners’ accounts within 72 hours of the promotion coming to an end.